Charles Le Brun was one of the greatest french artist and philosopher. He was one of the prominent artists in the 17th century and he was greatly influenced by Nicolas Poussin. Charles Le Brun's favourite study was about the physiognomy, which means study of the facial features. 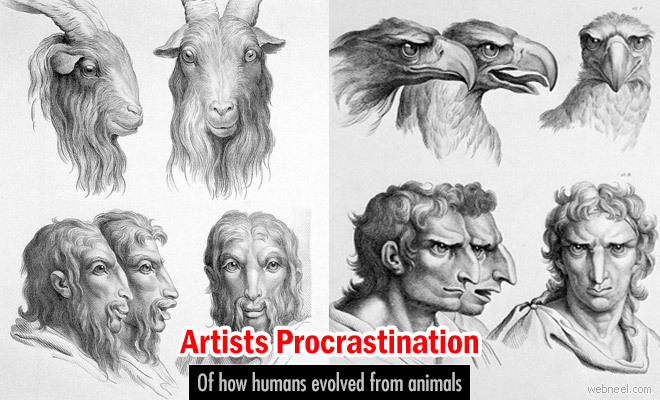 During one of his researches about humans, he had an imagination of how it would be if humans had evolved from a variety of animals and birds. Now here is a beautiful collection of his study. Did you know that humans evolved in Africa more than two hundred thousand years ago? And we are still continuing to evolve. Surprising isn't it?. Well, the oldest humanoid fossil was more than 4.4 million years ago, does that mean that we have stopped evolving? Evolution takes place when there are genetic changes happen due to mutation of genes during reproduction. Some of the evolution may be to immune the human bodies to survive viruses in a better way or alteration in the growth of the humans. Originally man couldn't survive anything other than mother's milk, later on when farmers started herding cows, buffaloes, human started to develop a tolerance to lactose. There are many people, who are still lactose intolerant, that's why we saw, human beings are still evolving. Initially humans used to climb and swing trees, now with smaller toes, we can walk briskly with them. Some scientists think that in future generation's humans will be born without the last toe since we need only big toes for balance. Imagine human beings with just a big toe on their legs, sounds creepy right. Some scientists also predict that humans in a few million years will be born with flat faces, big round eyes and tiny noses and these people will look at us like aliens just like we did of our ancestors.